Like Europe, America has been trying to jump-start its battery manufacturing capacities. The federal government has invested more than $2 billion to various companies working around automotive-grade batteries. In Michigan, many also got large state grants, but we’re still waiting for an American electric car wholly built and designed in the US. 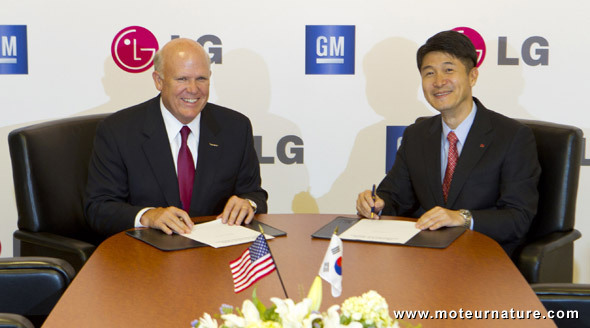 We may have to wait a bit longer than planned as General Motors has just announced it was joining forces with LG group of South Korea to develop upcoming EV models. There is something new and unexpected here. Much unexpected as barely 2 weeks ago, we had learned that GM will buy batteries from A123 Systems, an American company. With GM being a huge multinational company, with hundreds of suppliers all over the world, this should not be a reason to worry. GM can buy batteries from one supplier for one particular model, and from another company for another model. GM’s doing this everyday for tires or car seats, but LG won’t be a supplier anymore. The South Korean has seen its status raised to a “partner”. The picture above shows the CEOs of both companies as perfect equals. And that’s what they are. In its release, GM said it would no longer buy parts from LG, but that GM and LG will jointly design and engineer future electric vehicles. That’s quite a change of status for LG, and a surprising one considering it doesn’t have any automotive experience. Sure it’s building the battery for the Chevrolet Volt, and it will also build the batteries for the upcoming electric Ford Focus, but we’ve never seen an LG branded car. Maybe it will happen sometimes. And maybe some other time we’ll see an all-American EV car. But don’t expect it soon.